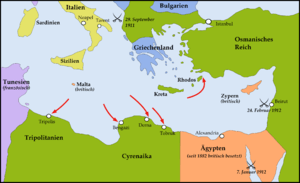 The Invasion of Libya by Italy happened in 1911, when Italian troops invaded the Turkish province of Libya, then part of the Ottoman Empire and started the Italo-Turkish War. The claims of Italy over Libya dated back to verbal discussions after the Congress of Berlin (1878), in which France and Great Britain had agreed for the occupation of Tunisia and, respectively, Cyprus, both part of the then ailing Ottoman Empire. When Italian diplomats hinted about a possible opposition of their government, the French replied that Tripoli would have been a counterpart for Italy. In 1902 Italy and France had signed a secret treaty which accorded freedom of intervention in Tripolitania and Morocco. However, the Italian government did little to put in practice the opportunity, and knowledge of the Libyan territory and resources remained scarce in the following years. The Italian government showed initially hesitant, but in the summer the preparations for the invasion were finally carried out, and Prime Minister Giovanni Giolitti began to probe the other European major powers about their reactions of a possible invasion of Libya. The Socialist party had strong influence over the public opinion. However, it was in opposition and also divided on the issue. It acted ineffectively against the military intervention. In spite of the time it had had to prepare the invasion, the Italian Army was partially prepared when the war broke out, mainly because of some opposition to the war in Italy (one of the main opponents was a young socialist named Benito Mussolini). Between 1911 and 1912, over 1,000 Somalis from Mogadishu, the then capital of Italian Somaliland, served as combat units along with Eritrean and Italian soldiers in the Italo-Turkish War. Most of the troops stationed never returned home until they were transferred back to Italian Somaliland in preparation for the invasion of Ethiopia in 1935. The Italian fleet had appeared off Tripoli in the evening of September 28, but started to bomb the port only on October 3. The city was conquered by 1,500 sailors, much to the enthusiasm of the interventionist minority in Italy. 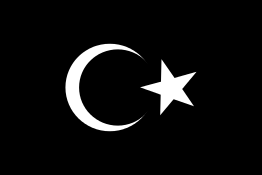 Another last proposal of a friendly settlement was rejected by the Italians, and the Turks determined therefore to defend the province until the last bullet but with a guerrilla war. The first disembarment of troops happened on October 10, under the command of general Carlo Caneva, and soon Tripoli, Benghazi, Derna and Tobruk were occupied. The Italian contingent of 20,000 troops was deemed sufficient to the accomplishment of the conquest at the time. Tobruk, Derna and Homs were easily conquered, but the same was not for Benghazi. 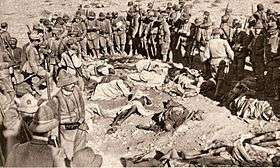 The first partial setback for the Italian troops happened on October 23 in the 1911_Tripoli_massacre#Sciara_Sciat_massacre, when the bad placement of the Italian troops near Tripoli led to their almost complete encirclement by more mobile Arab cavalry, backed by some Turk regular unit and by local civilians. However the Italians were able to defeat the Turk and Arab forces in a few hours. The attack was portrayed as a simple "revolt" by the Italian press, but got near to annihilate much of the Italian expeditionary corps. Which, consequently, was increasingly enlarged, until it amounted to 100,000 men, who had to face 20,000 Arab and 8,000 Turks, all badly armed. The war turned into a position one, and even the first use of aviation in a modern war scored little result. On November 2 there was a tentative of counterattack by the Ottoman forces in the small battle at Tobruk, but even here the city remained under Italian occupation. Meanwhile, 1,500 Libyan volunteers attacked Italian troops who were building trenches near recent occupied Derna. The Italians, who were outnumbered but had superior weaponry, held the line. A lack of coordination between the Italian units sent from Derna as reinforcements and the intervention of Turkish artillery threatened the Italian line, and the Arabs attempted to surround the Italian troops. Further Italian reinforcements, however, were able to stabilize the situation, and the battle ended in the afternoon with an Italian victory. Then the Italian command sent three columns of infantry to disband the Arab Turkish camp near Derna. The Italian troops occupied a plateau, interrupting Turkish supply lines. Three days later, the Turkish commander, Enver Bey, attacked the Italian positions on the plateau. The larger Italian fire drove back the Turkish soldiers, who were surrounded by a battalion of Alpini and suffered heavy losses. A later Turkish attack had the same outcome. Although many elements of the local Arab population collaborated with the Italians, counterattacks by Turkish soldiers with the help of some local troops (who declared a Moslem jihad against the Christian invaders) confined the Italian army to the coastal region since the beginning of the Italian invasion. 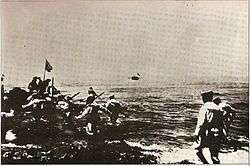 On October 15, 1911 nine Italian "Specialist Battalion" aeroplanes and 11 pilots landed in Libya. On November first the Italian pilot Gavotti dropped four 1.5 kg bombs on Ain Zara, pulling the pins with his teeth. This was the first aerial bombing in history. Italy meanwhile maintained a total naval supremacy, and could extend its control to almost all of the 2,000 km of the Libyan coast between January and the early August 1912. To unblock the situation, Italy began operations against the Turk possessions in the Aegean Sea, after having received approval from the other powers, which were eager to end a war that was lasting much more than what had been foreseen. Italy occupied twelve island in that sea, the so-called Dodecanesus, but this raised the discontent of the Austro-Hungarian Empire, who feared that this could fuel the irredentism of nations such as Serbia and Greece, causing unbalance in the already fragile situation in the Balkan area. The only other relevant military operation of the summer 1912 was an attack of five Italian torpedo boats in the Dardanels, on July 18. In the September, Bulgaria, Serbia and Greece prepared their armies for the war against the Ottoman Empire, taking advantage of its difficulties in the war against Italy. On October 8, Montenegro declared war against the Turks, starting the Balkan Wars. The invasion of Libya was a costly enterprise for Italy. Instead of the 30 million liras a month judged sufficient at its beginning, it reached a cost of 80 million a month, and for a far longer period than the original estimate. This caused economical unbalance at home. From the political point, the creation of Italian Libya showed (to observers like Benito Mussolini) that the lobbying power of an active and powerful minority could have a great power in the country, as the advent of fascism would show after World War I. As for Libya itself, the Italian control over much of its territory remained very ineffective until the late 1920s, when forces under general Badoglio and Graziani waged punitive pacification campaigns which turned into terrible acts of repression. Resistance petered out only after the execution of rebel leader Omar Mukhtar on September 15, 1931. Successively Libya was fully controlled by the Italians and integrated into Italian Libya and into Italy's Fourth Shore until World War II.